We have received reports from users of Vectorworks 2016 and earlier that they are unable to launch the application on new MacBook Pro models that include a TouchBar. 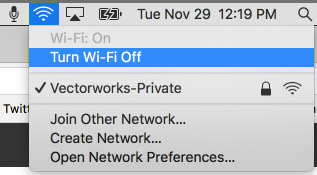 Many of these users were able to launch after disabling wifi, which can be done by simply clicking on the Wifi icon at the top right of your screen and selecting Turn Off Wifi. Vectorworks 2017 does not appear to be affected by this issue. We have not yet determined the cause of this problem.